I’m thrilled to share with you my most recent book. From Amazon or personal request we can get you hard-copies (or download e-book). A hard-copy let’s you mark this up as your own unique workbook (space provided) adding your personal notes, highlighting, and even sharing a copy with your spouse, partner or friend. To those who have given their time and their stories to help me with the research for YOUR BUSINESS, YOUR RETIREMENT, may I express my utmost gratitude to you. It’s intentionally brief because many have little time to read … and what we open here is just a beginning to you can start to clear away key hurdles or anxieties around retiring from business or professional careers. Sections 1-9 are especially built so two or three of these will immediately leap forward as relevant for you. After reading the introduction, focus first on the sections you want — even use this book out of order or back-to-front if you wish; it’s your choice! Section 10 summarizes other research and polls so you can easily digest what’s most important to you there. Afterward be sure to ponder the green/amber/red light piece in the conclusion. This is a book to facilitate valuable discussions about your future. In my mind, this is the most valuable part of this book. You can use this alone and also with family, with friends, team members, and to enhance insights from your advisory team. In your hands this book can launch 1,000 personal discussions that rise and flow beyond the words contained here! Would you meet further with me on this? As a certified retirement coach and financial advisor, we can open areas here to enrich and illuminate your future. We’ll help you confirm and capture the goals and dreams you want to enjoy. As well, we can build further on this together. We’re still adding to this research and stories of people like yourself. 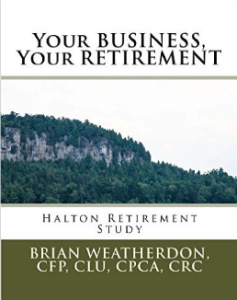 From business and professional careers we want to secure life’s path into the retirement (or non-retirement) of your innermost goals and dreams. (1) Who do you know that would benefit in receiving this book? …share this page with them. Your Business, Your Retirement, is designed to help us think about our business and career, retirement planning, family and personal satisfaction, and how we can enjoy the freedom and thrill of life through each stage of our future lifestyles … Starting from the introduction you’ll find 9 key themes, reflecting what you and others like you have shared with me as being most important in building a happy and successful future. If you like the feel of a glossy and full-colour hard-copy this is readily available on Amazon or by order from local bookstores (or directly from myself). 100% of proceeds goes to charity (outlined on the last page). Help us to widen the impact, to strengthen life, business, community at every level!